Shibata Yoshinobu Shoten specializes in handmade traditional magewappa crafts using aged cedar wood in Asakusa, Tokyo. These traditional Japanese quality products are durable and are made to be passed down from one generation to the next. Do you have a product you use everyday? Is there a story behind that product? How it was made and where was it bought? Who did you received it from? Next to Asakusa's Kaminarimon is Shibata Yoshinobu Shoten, a shop specializing in odate magewappa, a traditional craft of Akita Prefecture. These environmentally friendly crafts are strong and known for their longevity. 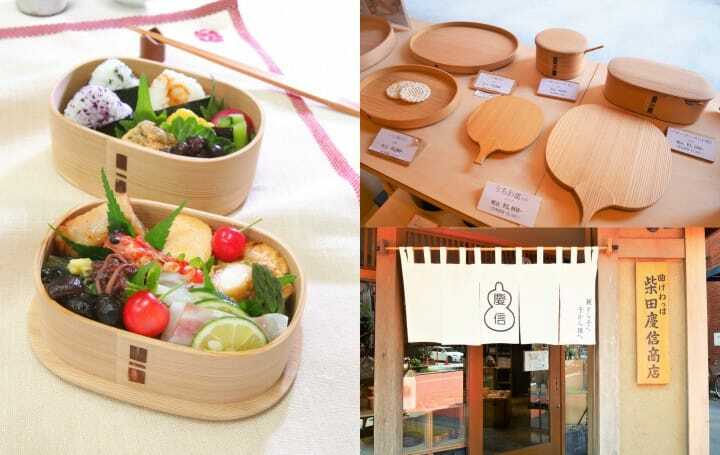 These goods are handmade and sold in different forms, including bento boxes, plates, and cups. They would make the perfect memento for your trip in Japan! Products Made from 150 Year-Old Aged Cedar Wood! Shibata Yoshinobu Shoten is a company from Odate city in Akita that manufactures and sells odate magewappa handicrafts. Magewappa is the traditional craft technique of bending thin sheets of wood materials such as cedarwood and hinoki cypress. Bento boxes are one of the more well-known forms of magewappa. Odate magewappa began during the Edo period in Akita prefecture where there was an abundance of natural cedar wood. Today, it is recognized as one of Akita's most well-established traditional handicrafts. Akita is a region with harsh winters where trees grow at slowly and form thin and uniform wood grains. Due to this, trees here contain strong and robust wood. At Shibata Yoshinobu Shoten, only natural cedar from mature trees aged 150 years and are used. Products are made from layers of this sturdy wood, creating durable, high-quality items. Delicate workmanship is required to achieve magewappa goods with excellent shape and finish. Hence, all products are handmade by artisans. This is why each product has a slightly different shape. As each item is made carefully by artisans, customers can enjoy a product that is unattainable in machine manufacturing. Upon holding these goods, you will find that they are surprisingly light! The lightweight factor is also unique to magewappa. The shop's atmosphere is cozy and calm, with a wafting scent of cedarwood. Products here are displayed below eye-level, giving customers a better overview of the products for better selection. We have listed three must-try products which have all received the Good Design Award, a comprehensive design award in Japan. A popular and classic magewappa product is the shiraki bento box. The term "shiraki" refers to unlacquered wood. The unlacquered wood provides the bento box with absorbency and breathability that keeps food moisture intact. Customers can enjoy their food at its freshest state even after time has passed (not suitable for microwave use). In addition to the standard eclipse and circular-shaped bento boxes, there are also several other shapes and sizes. One way to keep food from sticking to the sides of the bento box is to dampen the surface before assembling the food. To clean the bento box, it is recommended that you use a cleanser together with a tawashi(*1). Tawashi is available for sale at the boutique too. For more information, please refer to the pamphlets available at the shop or visit their official homepage (Japanese). *1:Tawashi: a dishwashing brush made from straw and palm trees. Shiraki Bento Boxes who have received the Good Design Award are: Nagate Bento Box, Osanago Bento Box, Omusubi Bento Box, Tsukushi Bento Box, and Ireko Bento Box. The tumbler comes in three sizes: big (6,264 yen plus tax), medium (5,184 yen plus tax), and small (4,104 yen plux tax). Made from natural cedarwood, this tumbler is capable of retaining the ideal temperate for your cold and warm beverages. To clean the tumbler, it is recommended to use a sponge and dishwashing detergent. The triangular symbol on every product represents the bind that bridges the wood together. Ordinarily, most products are marked with square-shaped binders. However, you can also find triangular shaped scale binders too. This binding is an adaptation of a sewing method from old books of the founder, Mr. Yoshinobu Shinobata. The wood texture and triangular symbol can be seen as fashionable patterns, adding accent to the products. Traditionally, magewappa handicrafts have centered around common household products like bento boxes and rice containers. However, at Shibata Yoshinobu Shoten, magewappa traditional craft techniques are used in a range of innovative products for every day. One of those innovations is the shiraki bread plate. This plate absorbs steam from freshly toasted bread, allowing users to enjoy slices of fluffy and crispy bread, without worrying about moisture accumulating in between. We tested the plate out on a freshly toasted piece of bread. After leaving the bread on the plate for a while, the steam caused a slight change of color on the surface of the plate. However, we did not see a single drop of water. The toast remained fresh and crisp. The shiraki bread plate comes in two sizes: big (7,560 yen plus tax) and small (3,240 yen plus tax). The shop also sells butter cases and butter knives, which you can use together as a set and dress up your dining table. The butter case comes in two shapes: oval (7,560 yen plus tax) and round (5,400 yen plus tax). The butter knife comes in two sizes: large for 756 yen plus tax, and small for 540 yen plus tax. Products You Can Use for More than a Decade! Shibata Yoshinobu Shoten (Asakusa Store) strongly emphasizes producing goods of quality and longevity, that can be passed down from one generation to the next. Magewappa handicrafts provide the longevity for each product to be used for longer than a decade. Due to their handmade nature, each product turns out to be slightly different. The product on the left was made over 13 years ago, while the product on the right is brand new. As time goes by, the wood grains will wear down, leaving a bumpy, yet soft surface. Its color will also begin darkening to a finish different than brand new products. If you have the opportunity, we highly recommend you to include magewappa handicrafts to your collection of household products. We believe that magewappa handicrafts will be a meaningful and memorable addition to your travel experience in Japan. Asakusa Kingyo - Catch Your Very Own Goldfish! Yoroshi Cosmetics: Take A Photo In Hakama To Share On Your SNS! 7 Tokyo Shops Where You Can Purchase Japanese Souvenirs!